We will pick you up from your cruise ship and we will drive you to the best highlights of our city. We use only modern, luxury, smoke free Mercedes Benz sedan, minivan, minibus. 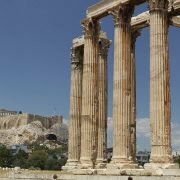 Our very friendly professional drivers and licensed guides with pleasure they will share their love about the historical sites, history, mythology & Greek culture. Tour are tailored made to reflect your interests, flexible on your own pace. You will have a great day a wonderful experience. Finally after an amazing private shore excursion we will drive you back to your ship! An unforgettable experience!